The pole stars also called circumpolar constellations in the Northern Hemisphere house the North Star, the brightest star that appears nearest to either celestial pole at any particular time. Owing to the precession of the equinoxes also known as THE GREAT YEAR, the position of each pole describes a small circle in the sky over a period of 25,772 years. Each of a succession of stars has thus passed near enough to the north celestial pole to serve as the polestar. At present the polestar is Polaris (α Ursae Minoris); Thuban (α Draconis) was closest to the North Pole about 2700 bce, and the bright star Vega (α Lyrae) will be the star closest to the pole in 14,000 ce. The location of the northern polestar has made it a convenient object for navigators to use in determining latitude and north-south direction in the Northern Hemisphere. There is no bright star near the south celestial pole; the present southern polestar, Polaris Australis (also called σ Octantis), is only of the 5th magnitude and is thus barely visible to the naked eye. All through the ages different culture around the world have observe these stars and have created stories what we know now as mythology. These observatory such as Nabta Playa in Egypt dating back 8,000 years or Stonehenge in England dating around 11,000 years where places where ancient man observed the stars and record events. 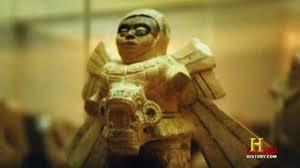 The ancient ones who watched the stars passed the responsibility on to there children or to specially chosen people, so for generation families recorded these movements, they became known as the sky people or the sun people. The astronautical movement of a celestial body (a star) takes 72years to move 1 degree in the sky, to observe a star or constellation move across the sky will take thousands of years. Imaging it take approx. 26,000yrs for the same star to return back to the same visible location in the sky from when you first observed it, if that's the case then you would have to wait at lest another 26,000years to confirm your first observation, that's over 52,000yrs astronomical recording celestial movement!. Herodotus claimed that chronological observation were made by Egyptian priest during a period of 52,000years and Pandoros stated that before the time of Menes (the first pharaoh of Egypt) that the reign of the seven Gods (Circumpolar stars) ruled the world. During this time the Great mother was known to be in the centre of the Great Wheel. The Temple of Hathor at Dendera was found originally buried in sand. It includes the first depiction of the northern hemisphere astronomical representations of the constellations, the zodiac symbols and several interesting hieroglyphs. The Temple of Hathor, at Dendera was dated through astronomical information to 1,700 BC, from the 18th Dynasty, however the temple was moved and rebuilt so correct dates are imposable. The catacombs that run under the temple now contain the enigmatic hieroglyphs and inscriptions so often quoted such as the electric light bulbs depicted with physical snakes inside them. The wheel of Dendera depicts the Northern Hemisphere constellation and in the centre you find Taweret the Great mother who had no consult, she gave birth to the cosmos without a male counterpart. The wheel of Dendera is the dharma what Buddha spoke of in his discourse on The turning of the great law wheel knowing this law (The wheel of Dendera)we gain an insight into the nature of the cosmos which expresses itself within you and throughout the world. The primordial sense of law and rule descrided by the egyptain was "em ser en maat," which means the strict accuracy of law is based on phenomenal repetition; millions of times this is what they explained as the formula for the eternal, the dharma. So we journey into astrotheology to gain an insight of the Sages mind. This time coincides with the age of Christ and Christianity, pisces is considered the last sign of the zodiac, a compendium of all the signs that came before it, from Aries to Aquarius. Pisces is the sign known for universal love, compassion, self-sacrifice, altruism, creativity, intuition and deep spirituality. Pisces know the truth of the universe but can't quite say why they know it. It doesn't matter, for Pisces know that "truth" is always in flux. To Pisces, what is in the human heart is true, for it is true to the soul. Pisces is an introspective sign. This Piscean mindset has been the way humanity has approached the world since we evolved and has colored everything that we have encountered during that period. Early Christians used the symbol of the fish (symbol of Pisces) as a secret symbol of their faith. The emphasis on washing of the feet as a ritual signifying purification of the spirit ties into Pisces symbolism as well, for Pisces rules the feet. Pisces "carry" the cares of others and often have sore feet. Christ spoke of his role as servant to his flock, which is also a very Pisces notion. Pisces says, "I believe," whereas Aquarius, the age we are in now, says, "Prove it to me scientifically." Christ's mother Mary embodied all the qualities represented by the Pisces polarity of Virgo, namely, modesty, commitment to service, and acceptance of what must not be changed. In Pisces, there is a strong need for seclusion, and Christianity puts value on retreats, convents, cloisters or spiritual pilgrimages. Aquarius puts emphasis on group activities and community, thus we have the Internet and the eye of the global village which we call television. Aquarius is a very social sign. Pisces is something of a "psychic sponge." Pisces like people too, but need regular time to themselves to rinse away the everyday cares they have absorbed. The total eclipse of the Sun that occurred in August 1999 was significant because it helped to get the world ready to launch into the main time of the Age of Aquarius. That eclipse occurred in the constellation of Leo, a sign that we call the "polarity" of Aquarius. This is because Leo exists at the opposite end of the spectrum from Aquarius, exactly 6 months away. That means the August eclipse was especially powerful and able to contrast, clarify and highlight classic Aquarius qualities. Not all eclipses are created equal. Some are more powerful than others and this one was considered to be very intense. In a way it was the mother of all solar eclipses. Because this eclipse also fell on a new moon, it pointed to the end of one way of life and a fresh beginning of this new era. Every sign has a ruling planet and Uranus is the ruler of Aquarius. Appropriately enough, Uranus has been moving through its home base of Aquarius, a process that takes seven years. This exciting planet of exploration and experimentation won't be back to the constellation of Aquarius for 84 years. Neptune is a planet that dissolves or purifies all that it touches, by rinsing in its waters, gently and yet consistently. Neptune is also moving us into an Aquarius state of mind. Neptune left Aquarius 2012, and will not be back until 2175! All these elements point to the probability that the Age of Aquarius has been established. In case you are curious, the very first age mankind experienced was the not determined through the zodiac but the pole stars and the constellation of the "the thigh" now called the Great bear is known as the primordial birthplace of the Northern Hemisphere. During the course of a year the Earth completes one orbit around the Sun. To us on Earth we see this as the Sun moving against the background of stars through the year, along an imaginary line which we call the ecliptic. This defines the plane in which the Earth and most of the other planets orbit around the Sun. The directions to the north and south ecliptic poles are at right angles to this. The Zodiac is the band of constellations running along the ecliptic. The Earth's orbit around the Sun takes 365.25 days. The Earth's axis of rotation, tilted at 23.5 degrees to the line of the poles of the ecliptic, gives us the directions to the north and south celestial poles. The bright star Polaris is currently showing us the direction of the north celestial pole. Like a spinning top this axis is precessing around the ecliptic pole with a period of 26,000 years. The celestial equator is the projection of the Earth's equator onto the sky. As the Sun moves in its apparent track along the ecliptic it is for half the year seen to be above the equator heading towards the summer solstice (northern summer) and half the year below the equator towards winter solstices (northern winter). The Sun will therefore appear to cross the equator twice in a year. Solstices means to stand still and during this time when the days are at there longest are days of light until summer solstices when the long day takes place in June. During the shortest days as we head toward winter solstices the dark takes over and there is a longing for the light. At the times when the Sun is crossing the celestial equator day and night are of nearly equal length at all latitudes and so we call these dates the equinoxes equal night. In March, as the Sun is moving northwards along the ecliptic, this is called the vernal equinox and in September as the Sun is moving southwards we refer to it as the autumnal equinox. The equinoxes are also the points on the celestial sphere where the ecliptic and equator cross and the vernal equinox is used as the zero point in measuring star co-ordinates. Vernal equinox therefore is used to determine the Age or the constellation ruling for the 2,166yrs and the Age returns approx. 26,000yrs later. The equinoxes occur on different days each year as the Earth takes approximately 365.25 days to go around the Sun; it the 000.25 days or 1/4 of a day. This is the reason we have a leap year every 4 years, to add another day to our calendar so that there is not a gradual drift of date through the seasons. For the same reason the precise time of the equinoxes are not the same each year, and generally will occur about 6 hours later each year, with a jump of a day (backwards) on leap years for the lost of time. Orion the Hunter is a sure sign that winter is near this heavenly cosmic giant rises horizontally, on his side, and is easy to spot. Look for his illustrious starlit belt. It is marked by three equally spaced bright stars lined up in a row. This famed Hunter's belt always guides you in imagining his hourglass physical form and always helps you discover several well-known heavenly bodies. During the end of November within the first two weeks of every December you can see Orion emerge above the eastern horizon. This fact does not change over thousands of years Orion and Sirius simply are never in the Eastern sky during sunrise on December 25th. 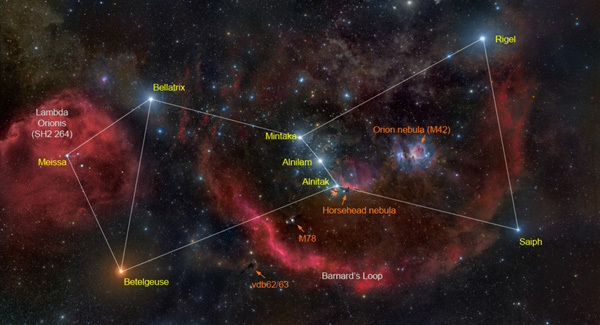 Orion along with Sirius is in the southwest sky if you are in the Northern Hemisphere or the northwestern sky if you are in the Southern Hemisphere. On December 25th of any year, Orion and Sirius are not in the sky until after sunset. The importance of Orion and Sirius is the winter solstice so on the December 24th the three brightest stars in Orion’s belt align. 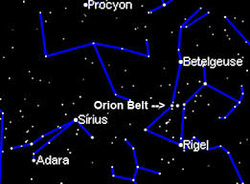 These three bright stars in Orion’s belt are called today what they were called in ancient times "the three kings." And the three kings and the brightest star Sirius all point to the place of the sunrise on December 25th. This is why the 3 kings follow the star in the east in order to locate the sunrise: the birth of the sun. There is another very interesting phenomenon that occurs around December 25th or the winter solstice. From the summer solstice to the winter solstice the days become shorter and colder, and from the perspective of the northern hemisphere, the sun appears to move south and get smaller and more scarce. The shortening of the days and the expiration of the crops, when approaching the winter solstice, symbolize the process of death to the ancients. It was the death of the sun, and by December 22nd, the sun’s demise was fully realized for the sun, having moved south continually for 6 months, makes it to its lowest point in the sky. Here, a curious thing occurs. The sun stops moving south at least perceivably for 3 days and during this 3-day pause, the sun resides in the vicinity of the Southern Cross, or Crux constellation. And after this time, on December 25th, the sun moves 1 degree this time north, foreshadowing longer days, warmth, and spring. And thus it was said: "The sun died on the cross, was dead for 3 days, only to be resurrected or born again." The term "moon cycle" (or "lunar cycle") refers to the moon's continuous orbit around the earth. As the moon orbits the earth, its appearance (the "phase") changes and thus gives us an indication of the moon's progress in the cycle (the "age"). The sun always illuminates exactly one-half of the moon, but we see it at different angles as it rotates around the earth. With the naked eye, we can see only the part of the moon that the sun is illuminating. For instance, a crescent moon is what we call the moon when we see only a small portion of its illuminated surface. We give the parts of the moon cycle different names, according to how the moon appears to us. First Quarter - commonly called a "half moon"
This complete lunar cycle (New Moon to New Moon) is also called a "lunation". During this time the moon will completely circle the earth. The moon cycle can affect the way we feel about things. In particular, when the moon is full or new, both males and females can experience dramatic changes in their mood and behavior. When the moon is full, stress becomes a major factor and people become more sensitive to details. An overload of work will add to the frustration and people will deal with their own needs rather than paying attention to others' needs. Often, a lack of assertiveness will be obvious. A new moon brings with it the sense of calmness. In this moon cycle, people's emotions get back to normal, their determination will return with the feeling that anything can be accomplished, and there will be more energy and acceptance of other other's ideas. The Moon's gravitational forces are strong enough to disrupt the balance of all water on earth by accelerating the water towards the Moon. This causes the water to 'bulge.' As the Moon orbits our planet and as the Earth rotates, the bulge also moves. The areas of the Earth where the bulging occurs experience high tide, and the other areas are subject to a low tide. The moon is full every month and women menstruate monthly so a women's menstrual cycles actually vary in length and timing but the average being about every 28 days, while the lunar cycle is quite set at 29.5 days, as the human body is about 75 percent water, the moon and the sun combine effect to create tides in Earth's oceans and effectively lifting the ocean away from the planet has the same effect on all life on earth.